Wolf Erlbruch makes existential questions accessible and manageable for readers of all ages. With humour and warmth deeply rooted in humanist ideals, his work presents the universe on our scale. He is a master of the illustrator’s art who honours tradition whilst opening new creative doors. Wolf Erlbruch is a careful and caring visionary.Wolf Erlbruch is an innovative illustrator. His visual style grows out of a long tradition and is characterized by strong lines and graphic precision. 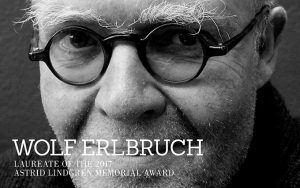 He often combines different techniques: collage, pencil and chalk drawing, graphic experimentation and watercolour.“Most important in drawing or writing for children is to be honest about your own feelings and tell about yourself also.”, says Wolf Erlbruch.